Sci-fi-online: What was the appeal of Three And Out for you? 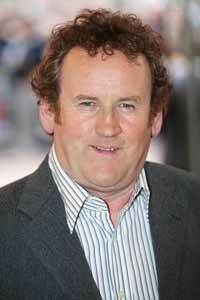 Colm Meaney: Well, you can tell people what it’s about in three sentences. "Train driver finds out that if he kills three people in a month, he’ll get the golden handshake. He’s already killed two, so he goes looking for a third. Finds this guy who wants to commit suicide, so they go off on the road together to sort out his life and try to put things back in order in his life to an extent before he jumps under his train". And that’s it. But within that, the characters are so well written and so well observed. Very often with dialogue you’re playing with it and trying to make it this, that or the other. People often say to me, what do you do in terms of research? With good writing, you don’t need to do that. With good writing it’s all there on the page and that was very much the case with this. It’s an absolute page-turner. They first sent it to me and I hadn’t heard anything about it and nobody in Los Angeles knew anything about it because it’s a London production, so I started reading it and it was a real page-turner. It’s been a tough one in many ways. But it’s a great script, a wonderful, wonderful script and great characters and a wonderful cast. I think everyone’s really pleased with the quality of work. SFO: You seem to flit a lot between TV and movies of all shapes and sizes, from this to Con Air. Do you have a preference? CM: I suppose it would be films like this in that I like the pace. We were shooting maybe five, six pages a day and that’s a good pace to work. You mentioned Con Air - the big ones can be such a drudge because you sit around for endless months. I don’t think that’s conducive to good work. When you get a bit of momentum going, you want to keep it up and keep it running. SFO: What kind of guy is Tommy Cassidy? CM: Tommy’s a guy who’s totally f*cked up his life. He was very happy-go-lucky in his younger days, probably, and he was a gambler and a drinker and messed things up badly. He basically walked away from his family, because he knew he couldn’t go back having done one nasty thing too many. For the last eight years, he’s been living alone, living pretty much hand-to-mouth, taking odd jobs, that sort of thing. But there’s still a spirit there, there’s still a kind of wisdom about life. In a funny way, Tommy is very accepting of the fact that he’s f*cked up. He doesn’t think it could have been any other way, almost. He’s not a guy who’s going around beating himself up constantly because he’s f*cked up. He’s got one shot at it and I f*cked it up and I’m sorry I did, but sh*t happens. SFO: Why is he suicidal? CM: We learn that he has a terminal illness. It’s unspecified. He obviously has kind of had enough. He sees there’s no way back to the life he had before. He’s very much in love with his wife still, I think, but he can see there’s no way back to that. His life really is not very pleasant and he doesn’t want it to go on anyway. I think what really triggers the desire to end it all is this illness. He’s pretty low when we meet him and I think he sees it going inevitably lower and lower and lower. He doesn’t want that. He still has enough of the spirit where he wants to be the one that says "enough is enough". I think he knows there isn’t any way back even if he can reappear driving a Mercedes and a nice suit and doing all those things he never could have done before. He still knows deep down. When he gets there and he sees Rosemary, initially she just throws a lot of missiles at him, but he gets through that and there’s still a connection there. Imelda [Staunton], who played Rosemary, was wonderful. It was wonderful working with her. I think we both played it where she has made a decision where she’s moved on with her life and she’s having a better life without him than with, and she realises this. She’s maybe tempted for five seconds, but she realises no, that would be a huge mistake and Tommy realises that, too. SFO: The movie hinges on the relationship between Paul and Tommy. CM: There’s a wonderful relationship between these two guys. Tommy almost becomes Paul’s mentor and Paul himself is a f*ck-up. Paul is not exactly Mr. Together. It’s like the blind leading the blind, it’s like Dumb & Dumber, and Tommy has his way of operating which is shocking to Paul. He calls the shots, he doesn’t mind breaking into a house occasionally or doing whatever is necessary to achieve whatever he wants to achieve and Paul is shocked by this. But Paul is learning a lot from Tommy as he goes along. So I think most of the humour is between these two characters who come from very different backgrounds with very different levels of experience and types of experiences behind them. Tommy becomes almost his mentor in crime. CM: There’s comedy material there. 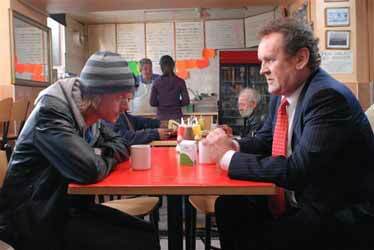 Tommy doesn’t mind Paul and he’s telling Paul to go out there and screw some lass, but not my daughter, thank you very much, you know? SFO: How much were you helped by the fact that you and Mackenzie are, on the surface anyway, very different people? CM: I think we are different. Mackenzie is a very introspective, calm, quiet, sensitive man. I think I’m probably none of those [laughs]. It’s not about our individual personality traits, necessarily, it’s more to do with, I think, that even though we’re both very different people, as actors we both recognised the material and recognised the comedy in the material and responded to it. We didn’t have to talk or rehearse that much with each other. We looked at it and we read it and we got it and that’s again a testament to the good writing and what a good actor Mackenzie is too. It’s just there, you know? SFO: You had quite a tight shoot across a number of locations. How did you find that? CM: Yeah, we were up in the Lake District. We had a lot of locations. I feel like every day when I go to work, even we’re shooting in London for about four or five weeks, like we’re driving to Leeds or somewhere. The locations are all over the place. SFO: Would you say there are any films that can be compared to Three And Out? It seems like there are elements of Withnail & I in there. CM: I hadn’t thought of that. I suppose there are similarities. What happens to you as an actor - "he’s an older Sean Penn" or "a younger this". I never liked that pigeonholing. If you went to pitch Withnail & I, or Four Weddings And A Funeral to a studio head, they’d tell you to f*ck off, but as soon as Four Weddings is a success, everyone is scampering around trying to find the next Four Weddings And A Funeral. It’s a stupid way to work. You don’t find good original material by looking for something similar to what’s been made before. I always resist that. I think this has a very unique tone to it. I think that’s what attracted us to it - it wasn’t like anything we’d read. This has a lovely tone and it’s got a wonderful bittersweet quality to it that I haven’t come across before, that works on this level as successfully as this. 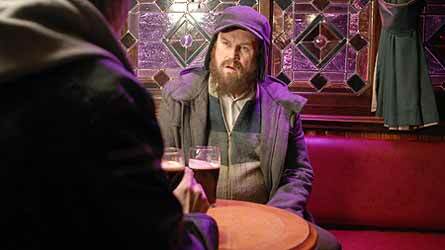 SFO: It is a comedy, but it goes into some dark places. CM: I think we were all a bit surprised at the table reading by how emotional it gets. 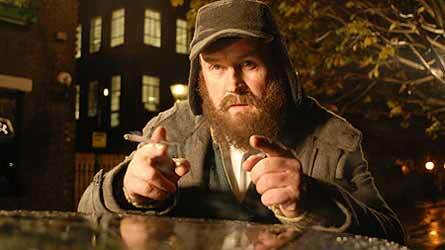 It’s an extremely emotional film, which I don’t think you had in Withnail & I for example. You care about these people and they’re in such a predicament, I think we were all taken by surprise by that. SFO: Jonathan Gershfield is a first-time director - how was it working with him? CM: He’s great and technically he has everything mapped out and laid out and he knows exactly what he wants and lets Mackenzie and I get on with it. We had a good rehearsal period and we talked about the characters and we knew we were on the same page in that department. I think he was very happy with where Mackenzie and I were coming from so he felt he could trust us. SFO: Thank you for your time.